From the inception of this project, we worked collaboratively with the clients and the builders to design, decorate and style a home that perfectly reflects its creative and inspirational owners. 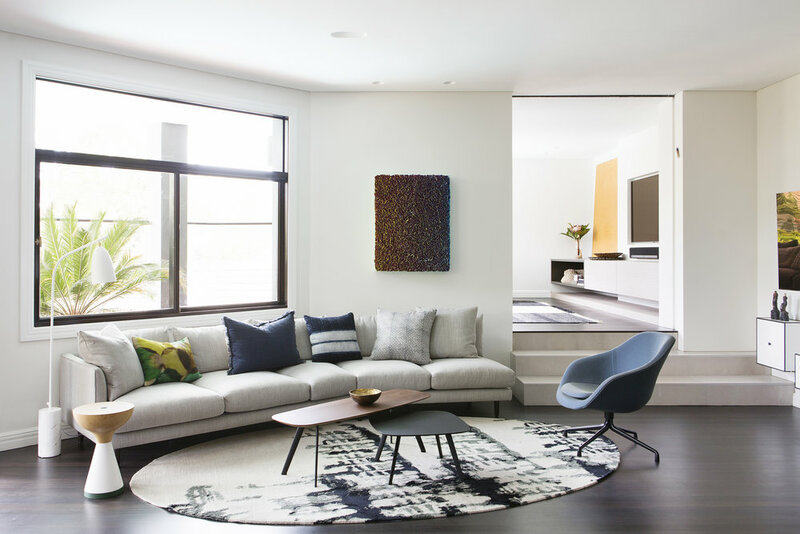 The clients asked us to revive their existing home with a nuance of sophistication whilst maintaining it as a wholly liveable space for the family of five. To do this, we meticulously created a balance between light and dark, using timber and natural stone to ground the space, while working closely with suppliers to create bespoke furniture pieces such as a custom buffet using ebonised timber with a vertical scallop detail, as well as a custom 3m dining table in solid American black walnut. Lighting is also of particular importance in the home, as it subtly highlights the new and existing art pieces collected by the family over a lifetime. We worked closely with lighting designers LA lounge to integrate a balance of task and intimate and decorative feature lighting layers. The old playroom was converted into a functional cinema room, which converts into an interconnected living space when not in use. The master suite is a sanctuary away from the children. The ensuite bathroom is open to the bedroom with a contemporary exposed track and timber door, while beautiful full-size slab walls are paired with chalky-toned marmarino walls and an oversized stone bath for two. The master suite’s decoration is luxuriously welcoming, from the hemp wallpaper, Poliform bedsides and Cult bedside lamps, to The Hub Furniture armchair and feature pendant lighting from Marz Designs. Entrusting us to create a warm, contemporary and timeless family home, the clients understood the value of investing in quality finishes, furniture, artwork and accessories. Every single piece selected for this renovation project had a purpose, tying the spaces together and creating a holistically welcoming interior.